Love earrings? I do. So I joined the Art Jewelry Elements 2013 Earring Challenge. To meet the challenge, participants must create a pair of earrings every week for a year. The earrings must contain at least one art bead. Every other Sunday we have a blog hop to share what we have made. Here are my designs for the past two weeks. Next weekend I am going to help Kristi Bowman with her booth at the Whole Bead Show in Lynnwood, WA. Naturally, I’ll want to wear jewelry that features Kristi’s awesome metal clay components. 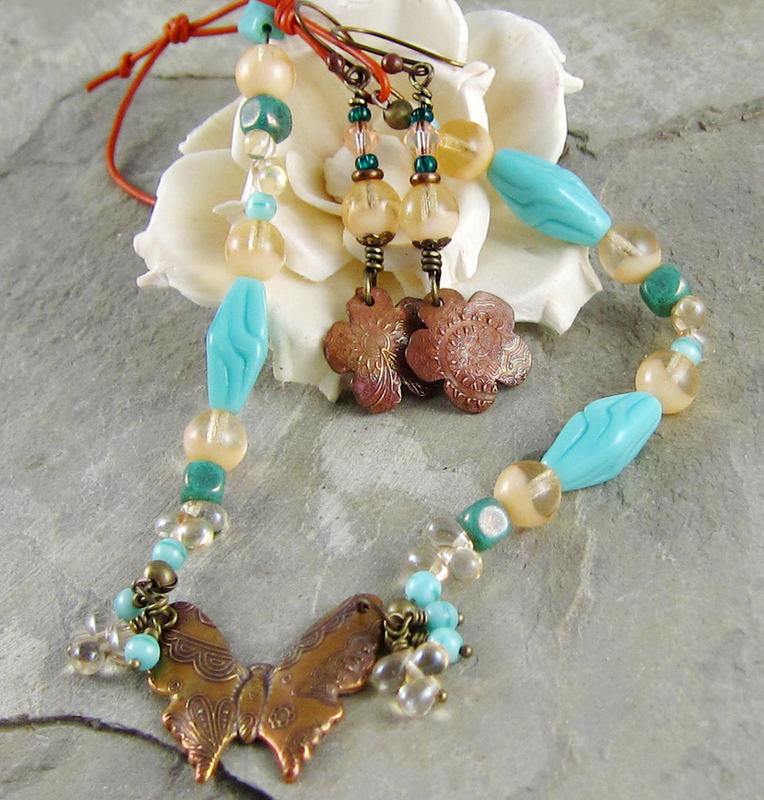 On Friday I wrote a post for the Art Jewelry Elements blog about a necklace I designed with a bronze clay butterfly pendant that Kristi made. So yesterday I made a pair of coordinating earrings. 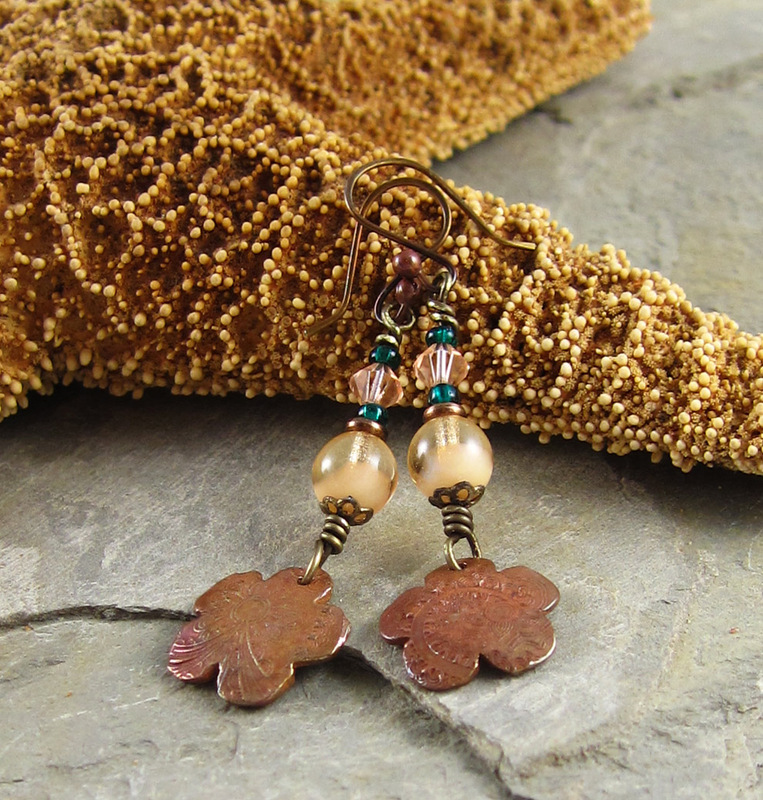 The April Bloom Earrings feature textured bronze clay flowers by Kristi Bowman Design. 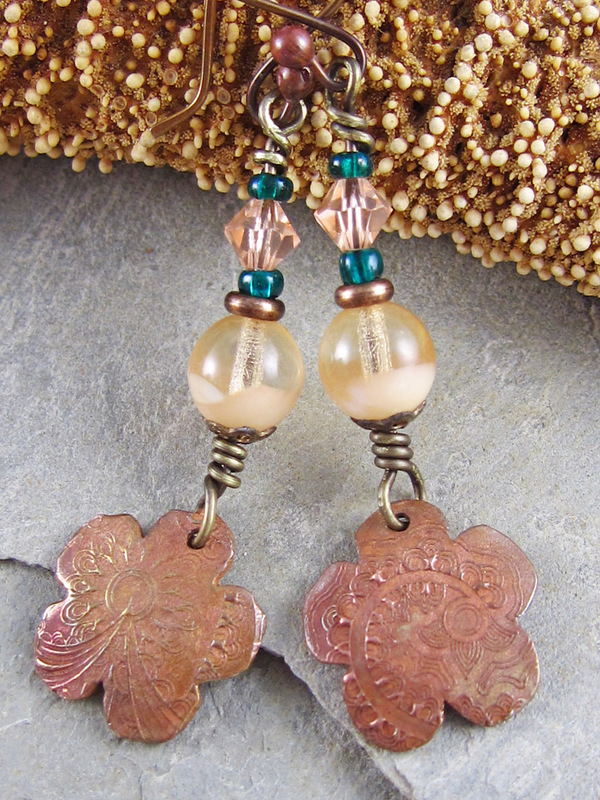 I paired Kristi’s bronze flowers with Czech glass, Swarovski crystals, seed beads and brass. Here are the earrings with the coordinating necklace. 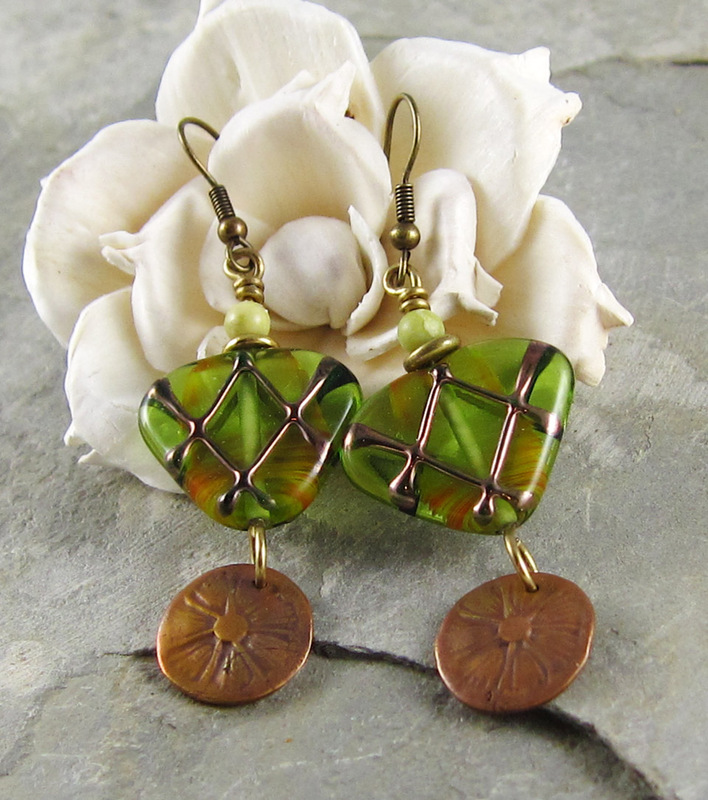 My second pair of earrings also feature bronze flowers by Kristi, but in a little bit different style. The glass triangle-shaped glass beads are highlighted with crosshatching bronze/brass colored metallic stripes. The intersecting lines create a diamond in the middle, which inspired me to call these the Diamond Delight earrings. I topped the glass beads with 4 mm serpentine rounds. This entry was posted in Bead And Jewelry Challenges and tagged Art Beads, Art Jewelry Elements, bead blog, blog hop, ceramic, earrings, fashion, handmade jewelry, Kristi Bowman, Kristi Bowman Design, Linda Landig Jewelry, Lynnwood WA, Whole Bead Show by Linda Landig. Bookmark the permalink. Beautiful earrings!! I especially like the April Blooms. Love the necklace too! Ad always, gorgeous earrings, Linda! Am really loving the unique look of the Diamond Delight earrings. FUN pair of earrings! Love them both, Linda… that first pair look great with your lovely necklace, yet not too matchy-matchy! Thanks Monique! That’s what I was aiming for! The earrings have some beads that aren’t in the necklace, but are in the same colorway. 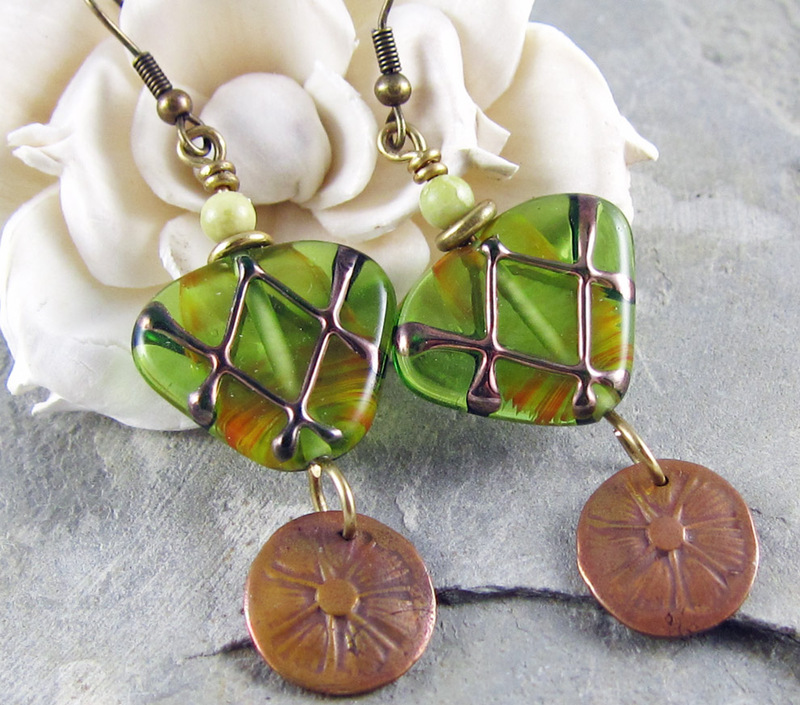 Beautiful earrings – I love the touch of blue/teal on the first pair, brings them alive! Thank you, Alicia. They were pretty blah, before I had the idea to add the teal seed beads.